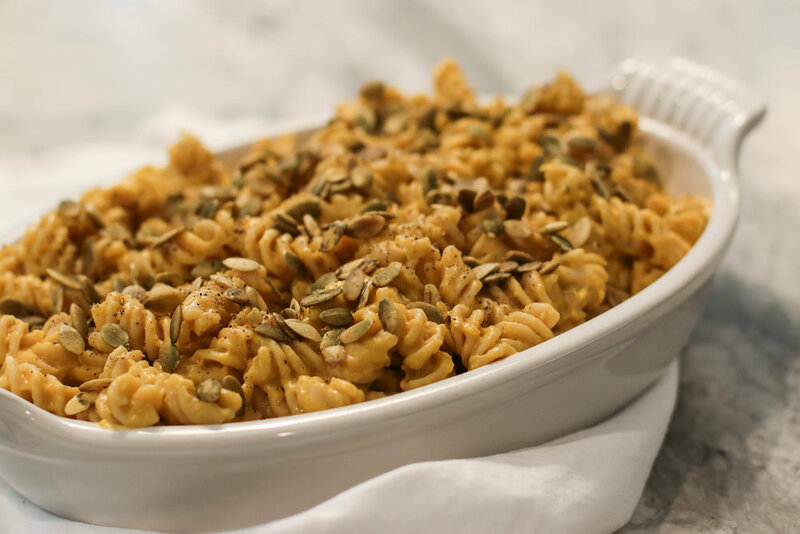 Butternut Mac & Cheeze — Erin Parekh | Live Well, Simply. I promise you'll never know this creamy, satisfying pasta is both vegan and gluten free. Plus it's got a hidden veggie inside. Preheat oven to 400F. Line a baking sheet with parchment paper. Toss chopped squash with one tablespoon olive oil, plus a generous pinch of salt and pepper. Roast for 30-40 minutes, tossing halfway through, until golden and tender. Meanwhile, prepare the cheeze sauce. In a medium sauce pot, heat the olive oil on medium. Add the minced garlic and cook until fragrant and just starting to brown, about 1 minute. In a small bowl, whisk together vegetable broth and arrowroot powder, making sure there are no clumps. Add the mixture to the pot and stir. Next, add the remaining ingredients (nutritional yeast, Dijon mustard, miso paste, salt, and pepper) and stir over low heat until thickened (about 2-3 minutes). While the sauce is cooking, boil the pasta according to package directions. Be sure to keep it al dente - with a slight bite. Drain well and toss with a little olive oil to prevent sticking. To finish the cheeze sauce, add it to a blender or food processor along with a heaping cup of the roasted squash. Process until smooth and creamy. Taste and adjust seasoning - more salt, another tablespoon nutritional yeast, etc. Return sauce to pot and simmer over low until heated through. Next, add the cooked pasta to the sauce and stir to combine. Serve warm and top with extra black pepper and pumpkin seeds. I like to mix in roasted broccoli, finely chopped kale, or another cup of the roasted squash to round out and bulk up the dish. Gotta get in those veggies! Save any extra squash for nourish bowls during the week. I also loved it tossed into salads.